Happy Monday! 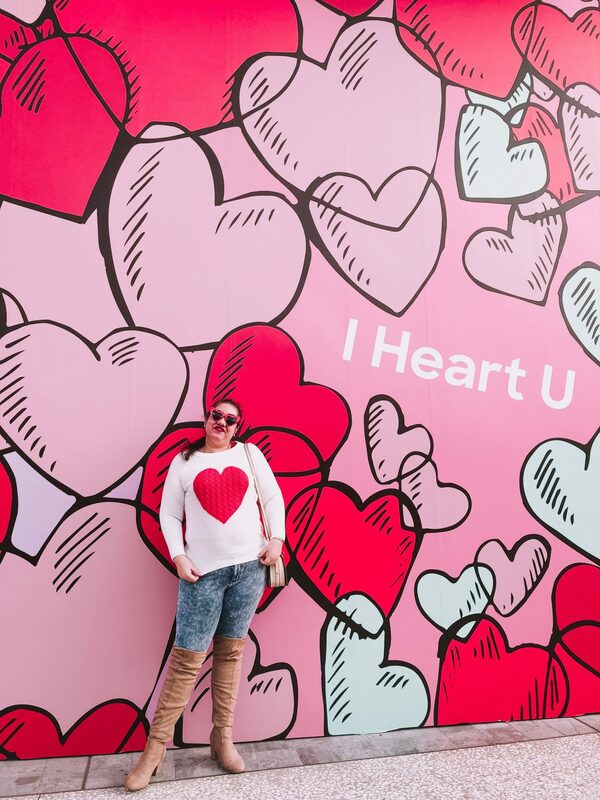 Today I’m sharing the perfect heart sweater for Valentine’s Day!I have seen this sweater everywhere and on my favorite bloggers. Since I finally have access to Amazon then I thought I would try it and buy this sweater and a few things from Amazon fashion. At least I found a new place to go shopping which speaking of you can read where I shop and buy my clothes here. 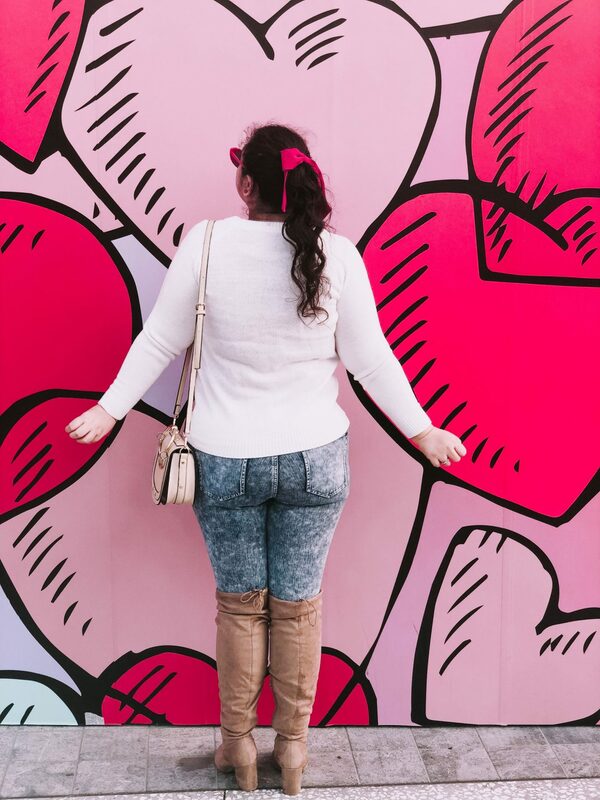 Also this would be such a great casual Valentine’s Day outfit idea and it’s the first look of my outfit ideas which a different outfit will be out until the actual day. 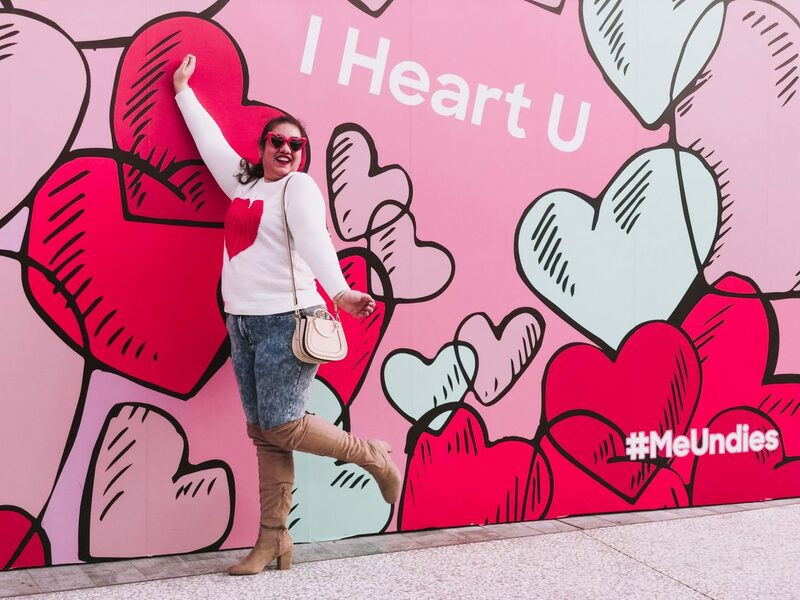 I love dressing for Valentine’s Day and styling different fun looks including this one so I’m excited to share the 2019 version of my V Day outfits. 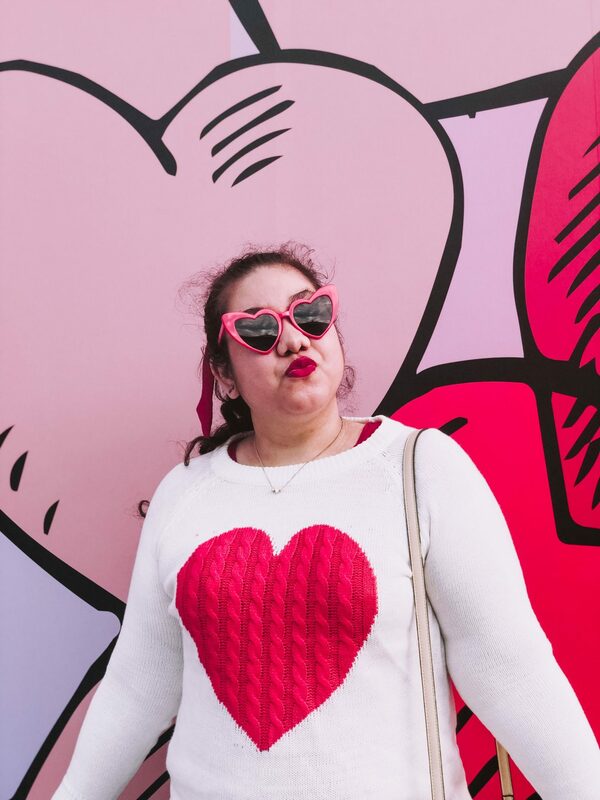 SO for now here is the perfect heart sweater for Valentine’s Day and how I styled it. 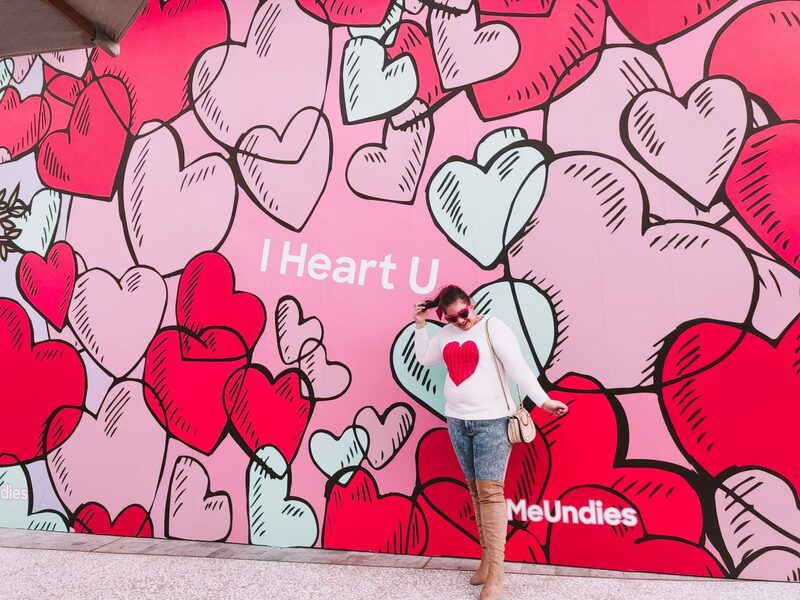 How did I find the perfect heart sweater for Valentine’s Day? Well it’s all over Instagram right now and I fell in love with it. One of my fave blogger’s linked it and it was the first time I ever shopped something and bought it off a blogger. I know a little late but I’ve been doing it more and more. Now a mini review of the sweater and my first time buying clothing from Amazon. I heard some good things and so it was my time to try. The sweater did take 2 weeks to get to me. I’m glad I ordered it early so I can shoot it before Valentine’s to share with you. It came in a zip lock bag and the packaging was pretty cute. It did smell really chemically so keep it in mind. The fit of the sweater was tricky for me. A lot recommended to size down as it was a bit over-sized but I am glad I got my regular size. I am wearing a large and it fits. It’s not too big or not too small. The sleeves however is a bit tight but I can still move freely without feeling constrained. The quality however is okay. By that I mean for the price I feel like I could have bought something with better quality. There is red thread right by the heart so it isn’t the best and looks a bit out of place. I have to wear it again and see how it washed to really see but I think it’s okay. I styled this look to be quite casual to begin with but I dressed it up with my heeled over the knee boots. I love the taupe color and thought it would look nice with the white. I brought out my Chloe Nile dupe bag and I’ve linked the actual one and the dupe here. I haven’t used this in a while and I loved the cream with the white so it made a perfect match. The accessories I tied this red ponytail bow in my hair. I wanted the pop of red and so all my accessories are red. 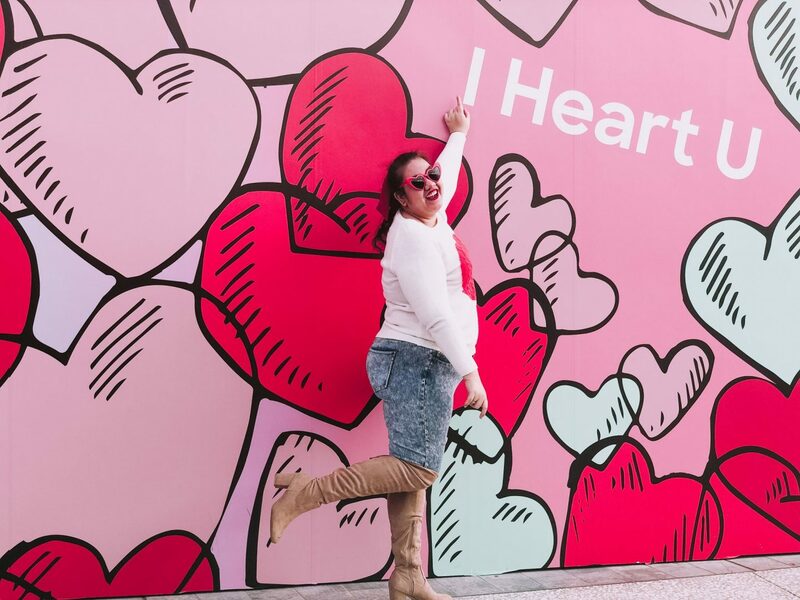 My sunnies are so cheap and under $10 and are perfect for Valentine’s Day. I didn’t have red heart earrings so I wore red bow studs that are from Christmas and lastly my necklace is a gold heart pendent. 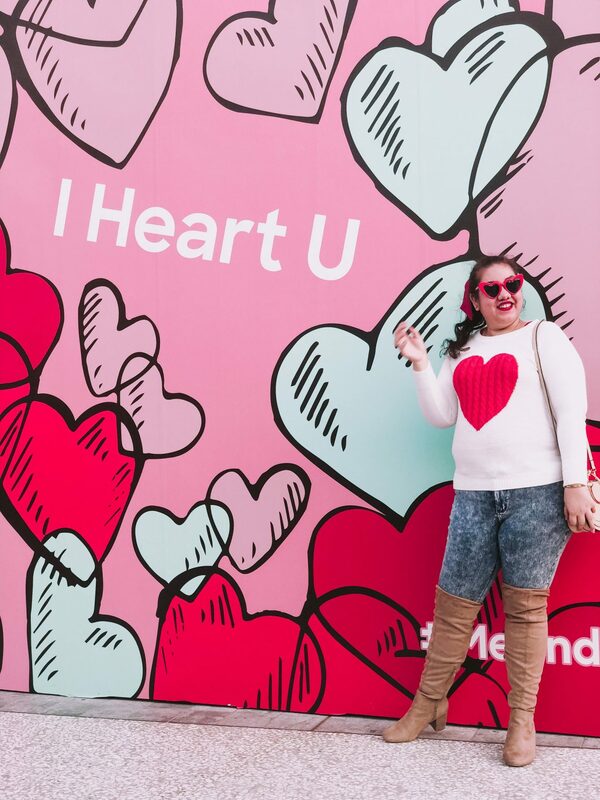 That was the perfect heart sweater for Valentine’s Day and how I styled it! 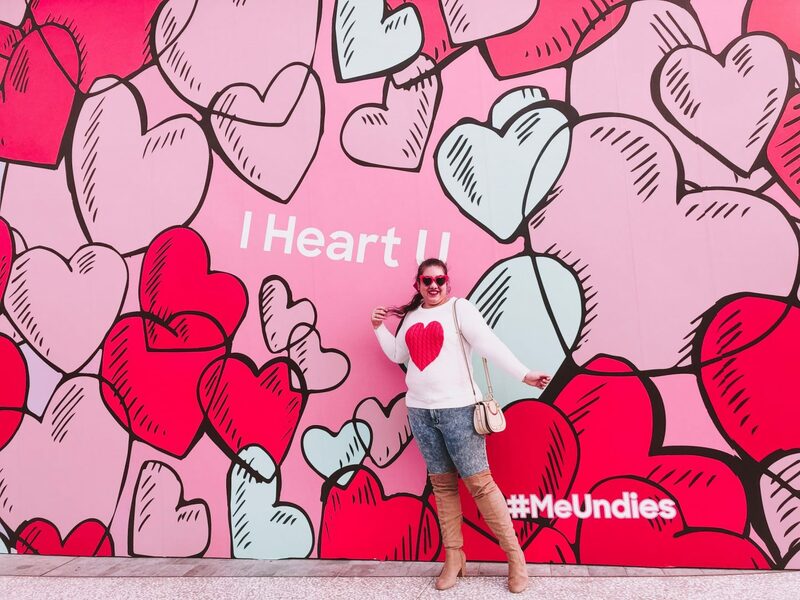 I hope you liked this Valentine’s Day outfit idea. I am in love with where I shot these and the background is so cute and was perfect with this outfit. Let me know if you’ve bought any clothes off Amazon and your thoughts on it. 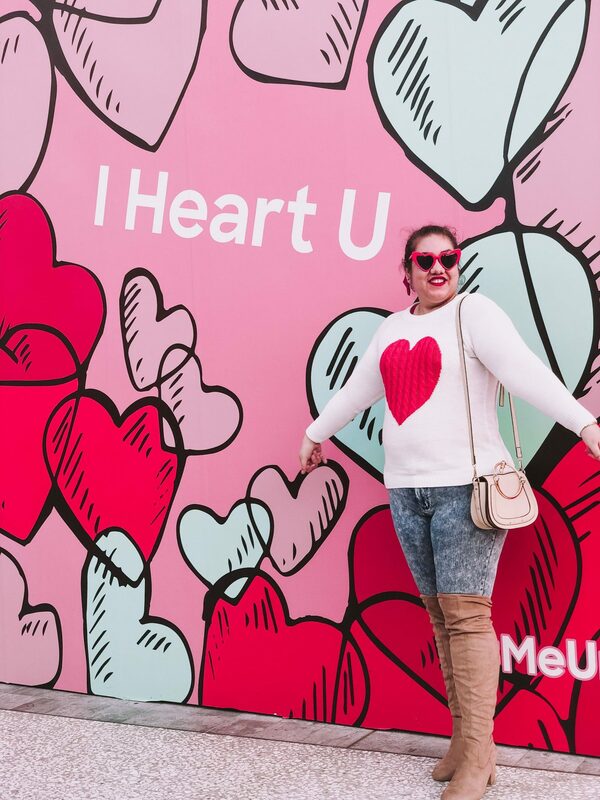 So I’m hoping you enjoyed the perfect heart sweater for Valentine’s Day and got some inspo on what to wear! I love this sweater! 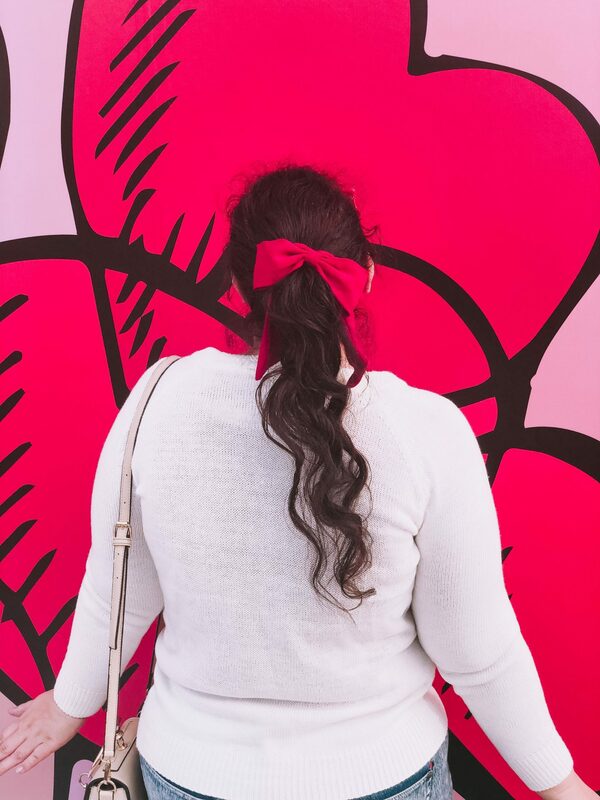 What a cute pop of red and perfect for Valentine’s Day! Thanks Caitlin! Glad you loved it and you are so right not too much but just enough red. 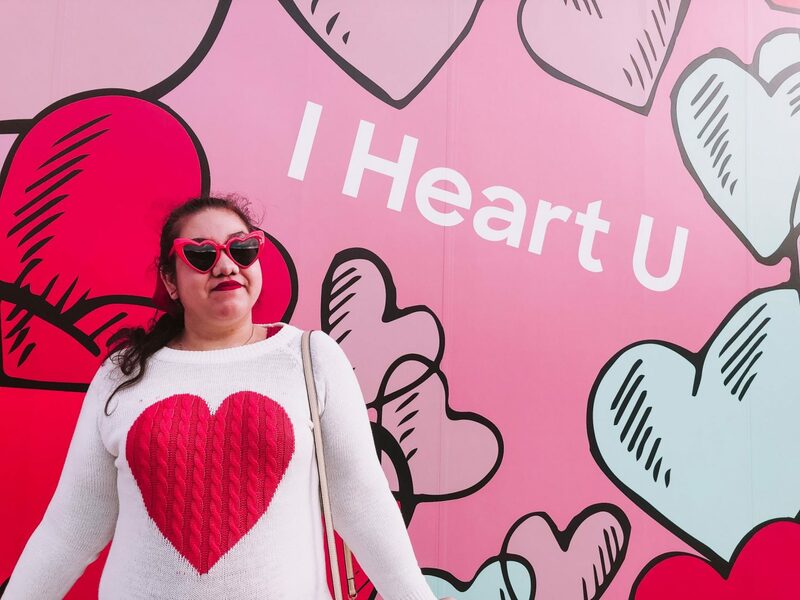 I’m definitely a fan of girl pink outfits on Valentine’s Day! This sweater is adorable! I really like your boots as well! Thanks Madi! I love them as well but it’s nice to have variety too so glad you loved it! Such a cute sweater! I just love the one red heart ❤️ in the middle. So simple and fun! I definitely need this for Valentine’s Day! Thanks Chelsea! It is and def a cute sweater for it. This is super cute! I love the casual look to it but dressy enough to wear out. You look beautiful in it and I just love that backdrop! Thanks Shannah! Glad you loved it and I think the backdrop was perfect! 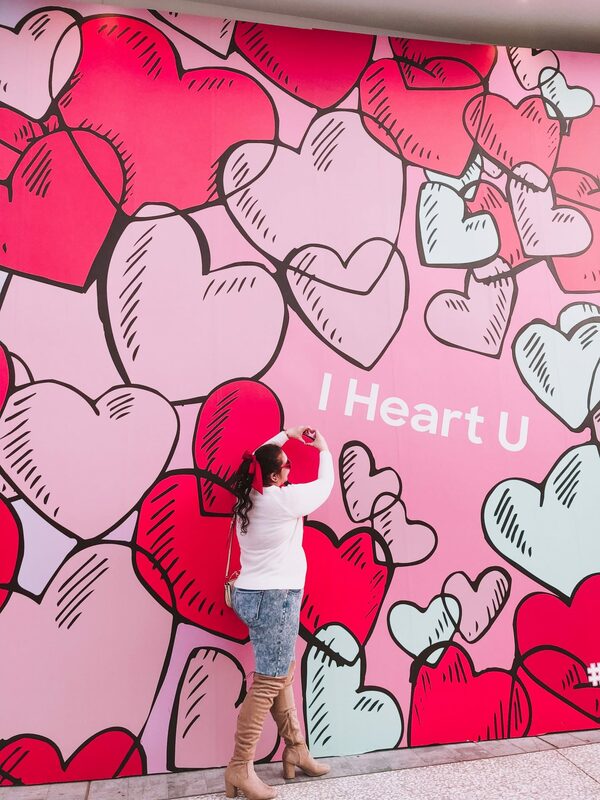 So cute for Valentine’s Day! 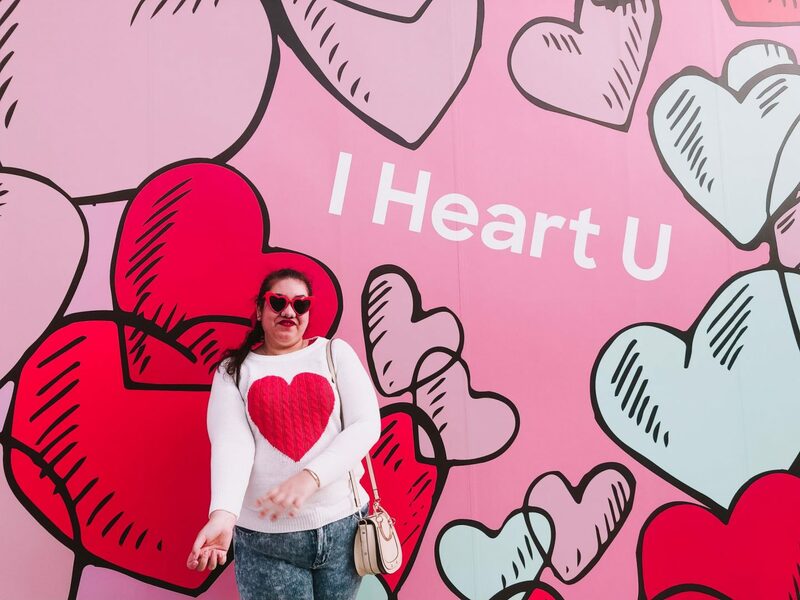 Love the heart! Thanks Carolyn! It is and glad you love it! Thanks Ashley! I was at first but it’s just a hit and miss. I’ve learned you can always return if you need to.